Governor Greg Abbott today met with India's Minister of Petroleum and Natural Gas, Dharmendra Pradhan, in New Delhi, India. During the meeting, the Governor thanked Minister Pradhan for his warm welcome and expressed his desire to increase energy trade between Texas and India. This is the Governor's second time meeting with Minister Pradhan. "India is one of the most prolific economies in the world, and growing economies need access to energy," said Governor Abbott. "As long as India has a need for oil and natural gas, Texas will be a willing partner to provide it. As this energy trade continues to grow so will the Texas economy, and I look forward to many more years of this tremendous partnership." Governor Abbott began the meeting by discussing the meaningful contributions of the growing Indian population in Texas both economically and culturally. The Governor then expressed his excitement about opportunities to increase shipments of Texas oil and liquified natural gas (LNG) that began only recently. The Governor also emphasized Texas' efforts to add LNG and oil export facilities across the state that will ensure India's energy needs are met. 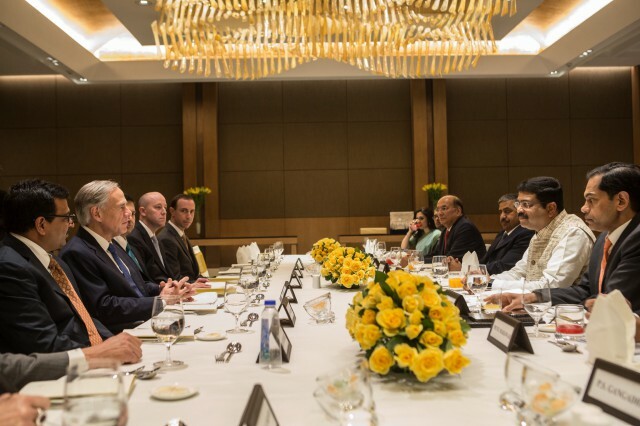 The two leaders concluded the meeting by discussing their mutual desire to grow the Texas-India relationship, and the significant impact it will have on their respective economies. Following the meeting, the Governor and Minister had lunch together and continued their discussion of energy trade.